A horoscope guide to the month ahead for Cancer and Cancer Ascendant. Monthly horoscopes are divided into 3 groups (or decanates) per sign for more accuracy. Keep in mind that if you know your Ascendant, it’s best to read forecasts for both your Sun sign and your Ascendant sign. If you know your birth time, but don’t know your Ascendant, be sure to see How to Obtain Your Astrology Chart here or look up your Ascendant quickly with our What’s My Ascendant tool. We’ve divided our 2019 monthly horoscopes into 3 groups (or decanates) per sign for more accuracy. Remember that if you know your Ascendant, read forecasts for both your Sun sign and your Ascendant sign. If you know your birth time, but don’t know your Ascendant, be sure to see How to Obtain Your Astrology Chart here. See also Cancer Good Days Calendars and This Month in Astrology. 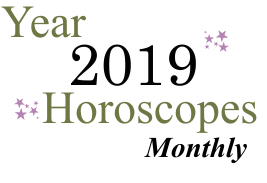 April 2019 Monthly Horoscope Overview for Cancer: April brings a sharper mental focus and easier decisions, dear Cancer, but also a general need to carve out special time for rest and detox. Both your career and adventure sectors are quite active this month, and you'll have several prompts to take care of business, update your skills, and answer to calls to refresh your spirit. At the same time, Mars spends all of April in your privacy sector, and this is much like running on a low battery -- you need to take the time to recharge! There can be focused attention to your professional goals or responsibilities in April, but you may not always have the personal energy to match some of the demands on you. Do your best to keep up with opportunities, while avoiding pushing yourself to inhuman levels. You're more accident-prone and inclined toward making errors during this period, but only if you are not listening to your body's signals to slow down. The New Moon on the 5th brings a renewal of professional steam and the ability to overcome stumbling blocks in your career. You may have been distracted from the larger plan or the bigger picture in recent weeks with Mercury retrograde in your solar ninth house, but with that now firmly behind you, you're finding it more natural to reach higher in the coming weeks. There can be improvements or a feeling of more effectiveness in educational or promotional pursuits. You're more likely to actively create and shape your life than to simply let others make decisions for you. There can be some slowdowns, reality checks, or a break in momentum occurring in your professional life nevertheless, but it's also a time when you can get back on track and organized. Stops and starts can frustrate, but they can also motivate! While things may not be moving forward very quickly, you can be gaining important ground in less overt ways, such as by earning respect from people you work for (or with) and developing new skills that benefit you in the future. For some of you, there can be a need to restructure. As you reach for your goals, you may encounter some resistance from someone in your life, or you can feel divided between a relationship and an ambition. This cross-purposes problem seems ongoing, and you'll have time to work through it, but it can cause you some tension this month, particularly around the 9-13. Wonderful opportunities with work or health can emerge around the 14th, though, and it's a nice boost to your confidence. Love is adventurous in the first three weeks of April, and a little more serious after the 20th. Money opportunities come through a partner or management of others' resources. As the month progresses, you become increasingly interested in fulfilling happiness goals and less focused on performance. With Mars in your privacy sector all month, there could be an emphasis on working in isolation or behind the scenes. Your energy levels may not be at their best, as you require more time for rest and contemplation. You might also be dealing with a reshuffling of your priorities, desires, or projects, and this can be a temporary drain on your levels of motivation. Working on your own at your own pace would be ideal if you can manage it. But with a strong showing in the very public part of your chart, and more specifically, Venus there from the 20th, it would be a great idea to avoid cutting yourself off altogether. Connecting with others is important now, bringing you some great benefits. Mars will enter your sign on May 15th, by the way, and then you'll be feeling more outwardly effective, assertive, and decisive. It's not that you're struggling until then--it's more about observing, recharging, and healing, and/or preparing for the upcoming active period. Delays related to education or travel clear up, and you have a better idea where you stand. This is true for personal and business partnerships as well. Give special attention to home and family around the Full Moon on the 19th. Further developments on the domestic front deserve your time and energy and can serve to help balance your life with so much focus on your responsibilities to the outside world these days. The Sun's move into your social sector on the 20th and its meeting with lively Uranus there on the 22nd are strong for your social life and your sense of community, both romantic and business partnerships, negotiations and agreements, and group involvement. There can be a new beginning of sorts with a friend, or you could be broadening your horizons through networking and meeting interesting people as you head into May. Existing relationships can be rejuvenated. The Sun continues to put a spotlight on your solar tenth house. Satisfaction and fulfillment during this cycle come from doing your professional best, shining as a responsible and capable person, and contributing to the world in practical ways. You might have a chance to receive acknowledgement or praise for your work or good character now. Landing support from authority figures is easier at this time. Avoid the pitfalls of pride or arrogance standing in your way of success. The Sun lights your solar eleventh house. The Sun illuminates your sector of friends, groups, and dreams coming true this month. It's a sociable sector of your chart, and that's exactly how you are feeling--happy, light-hearted, cosmopolitan, and social. Group affiliations capture your attention. Connections can be made now and networking pays off, or at least satisfies. Being part of a community or circle of friends and building your social network is important to you at this time. This is a rather happy, goal-oriented cycle. A lively agenda is promised, you're attracting quite a bit of interest, and your energy for making contact with others is high. A stronger sense of community is with you during this cycle. Relationships take on a fun, if impersonal, tone now. Activities with children (especially others' children) may increase. You are more stimulated by all that is unconventional during this cycle, and your ideas are original and progressive now. This is a time to follow your dreams and ideals, and to plant a seed in the form of a wish for the future. Venus continues to grace your solar ninth house. During this cycle, your ideals in love are set high. You might become inspired by a loved one now, or someone might awaken a new perspective or way of thinking in you. You could also enjoy a trip, or a new adventure of sorts. In fact, you are attracted to anything that is non-routine and fare best when you are reaching out beyond your usual bounds. You might be attracted to people or even objects that are exotic or different in some way during this cycle. It's a good period for personal charm and attractiveness in general. Venus graces your solar tenth house now. During this cycle, you are most charming and well-received on the job. Your responsibility and authority are likeable qualities now, making this a favorable period overall for schmoozing with those in a higher position than you, as well as for negotiations or social activities related to business. Venus is charming, friendly, and affectionate, and her presence in your career and reputation sector brings social opportunities to your career. You are coming across well at work now, and romantic opportunities, or simply more chances to socialize and network, are likely. You are socially ambitious right now, and success may come through your good managerial qualities or some form of artistic talent, or, indirectly through your marriage partner. People who turn your head during this cycle are those who come across as especially competent. Mercury continues to transit your solar ninth house. During this cycle, you are especially fond of exchanging ideas with others, particularly your personal philosophies. You are inclined to take a broader look at things now, rather than concentrate on the details. You are communicating with more persuasiveness, enthusiasm, and optimism at this time. Mercury transits your solar tenth house. You are likely thinking a lot about your career and business matters, or your career requires more communication than usual during this cycle. You speak with authority during this period, and you are more accountable than usual for what (and how) you communicate. Your ideas may come into public view now. Use the power of words to influence authority figures. This is an excellent period for developing career and professional plans or strategies. You may be turned to for advice or for your opinion on important matters. Although approachable and ready to communicate, you are less inclined towards chatting about frivolous matters now. You tend to think about your position or standing on a professional level more frequently during this cycle. You are likely doing some multi-tasking regarding career and business matters. Negative use of this influence would be to worry unnecessarily about your reputation and responsibilities. Mars continues to energize your solar twelfth house now. While Mars occupies the twelfth house, asserting yourself in a direct and straightforward manner can be difficult. This is largely due to a feeling of not being in touch with what it is you want or desire just for the time being as you reassess your goals and needs. This lack of direction and self-knowledge should prompt you to look within to learn about your desires. It is likely that you will be much clearer when Mars reaches your first house. For the time being, take some time for rest and give your ego a break. See our Time Line Forecast report for a personalized forecast for the year ahead. Get your unique Personalized Horoscope for the year ahead—over 100 pages long—for a detailed guide to your best days and your most challenging days for attracting love, career success, communication, and more. birth chart reports, relationship reports, future forecasts, and more. Love & Romance Forecast report. the Synastry and Love Ties reports. See also general trends for Cancer in 2019. The Sun illuminates your career and reputation sector. More than any other time of the year, your focus is drawn to your "place" or standing in the outer world, and your reputation. This is the time when you are more interested in, and focused on, accomplishing something important. Your competency is something that you are especially sensitive to during this cycle. You want to shine. Your vision is practical right now, and you want to see tangible results for your efforts. More contact with authority figures is likely during this period. Recognition is likely to come your way whether you ask for it or not, and the responsibility that comes right along with it! Do what you feel is right, keeping in mind that you are at your most visible during this period in the year. Venus continues to move through your solar eighth house during this period. You are attracted to the deeper elements of relationships and social interactions now, rather than what you meet on the surface. Mysteries fascinate you and you could be looking for others' motives for doing and saying what they do. It's a good time to feel supported by others, whether it's financially or emotionally. It's also a strong cycle for discovering your own hidden talents as well as fascinating things about a partner. Venus graces your solar ninth house during this period. A taste for the exotic takes hold during this cycle. Routine affairs simply don't seem to satisfy. You receive pleasure from anything that expands your horizons, both physically and mentally. Foreign people and places may particularly appeal now. You tend to be expansive and generous when it comes to love. A love interest who attracts you during this cycle may be somebody who you previously wouldn't consider attractive, or someone whose cultural background is very different than yours. You have a taste for the exotic and the spirit to match. Public relations work, promotion, and other such endeavors are favored now. It is more about how you express yourself than the specifics of what you are saying that helps sway others to your position. There could be especial rapport with foreigners and with women if you are traveling during this period. You are all the more attractive and charming with this position, which increases your popularity. If a romance were to begin now, it is more likely to be with someone of a different background or educational level, or someone you meet through travel. You have a taste for the exotic now that can show up in many areas of your life--who you are attracted to, what you buy, the kind of art or entertainment you enjoy, and so forth. Mars continues to activate your solar eleventh house. You take a more direct approach to realizing your dreams now, rather than simply hoping and wishing. You might find that you have more energy and enthusiasm for spending time with others, but arguments now may be with or on behalf of friends. You can be especially effective at encouraging others now, as well as at leading or organizing a group. With Mars moving through your solar twelfth house, this is the time to research and reflect upon your goals. It can be a time when past actions catch up with you--and this is not necessarily a bad thing! It could also be a time when much of your energy is channeled into private matters, or when you prefer that others not observe what you are doing. This is natural--you may just as well do your best work alone for now. Unconscious behavior patterns could influence the way you assert yourself. Some may experience insomnia during this phase, especially if they are not allowing themselves the chance to recoup and if they are not letting their intuition serve them. Others may enjoy a more active dreaming life (this includes day-dreaming), and, if allowed to run free, the imagination can serve them very well, especially with regards to goals and new concepts. See also detailed 2019 Yearly Horoscope for Cancer. The Sun continues to shine its light on your solar ninth house now. This is a cycle in which you seek to expand your experiences and awareness, whether through philosophical thinking, higher education, travel, or simply activities that take you away from your everyday routines. You may feel a little restless if you don't find ways to explore. It's an excellent period for looking at your life from a different perspective--a broader one--whether you initiate this process or you make contact with others who stimulate you to think about your circumstances differently. Your energy is strong, open, and friendly right now, you come across well to others, and you are a little bolder and adventurous than usual. Mercury continues to transit your solar eighth house. The ability to analyze and rationalize some of the deeper elements inside yourself and in your intimate life now can benefit you. This is also a good time for sorting out finances, particularly money shared or coming from other sources other than your own personal income. You might particularly enjoy discussing topics that you typically don't verbalize with someone special during this cycle. Anything taboo, mysterious, or puzzling can be especially fascinating for you just now. You have little interest in small talk. You are more aware of subtleties and nuances during this cycle, and you can use this increased insightfulness to improve your life. Mercury transits your solar ninth house. Not content to focus on mundane, practical affairs just now, your mind turns to bigger visions, thoughts, and ideals. You are open to expanding your knowledge base during this cycle, and communications from or with someone far away may be part of the picture. You are putting everything into perspective now, rather than compartmentalizing. Instead of simply shooting the breeze, you are more inclined to discuss broader philosophies now. Your inclination during this cycle is to think about the "big picture" rather than the mundane circumstances and details of your life. Missing appointments and other forms of forgetfulness could be part of the picture now. Find out about your year ahead with a revealing Sky Log Report for only $5.95 or a birthday year overview, the Solar Return Birthday Report for only $4.95. Our detailed monthly horoscopes are designed to reveal and interpret the current transits of the Sun, Mercury, Venus, and Mars in your solar chart. Because these energies or transits do not unfold neatly into any given calendar month (many transits carry forward from one month to the next), you will find some of the energies continue from a previous month. For example, the Sun might transit the second house of your solar chart from June 21 to July 22, so that you will find a similar interpretation for this transit in both June and July’s horoscope. This is normal and expected. Transits don’t abruptly change as the calendar month changes. These monthly horoscopes also include an overview paragraph, as well as other energies specific to the month, such as retrogrades, eclipses, or major outer planet transits. The Lunar Cycles section reveal lunar cycle dates. Lunar cycles repeat themselves approximately every 28 days, so it is normal to see the same lunar peaks, such as “Your Personal New Moon” and “Monthly career peak” repeat themselves from month to month, but with different dates. They serve as a helpful guide to cycle peaks in different areas of life, such as financial, career, romance, and partnership. The horoscopes are divided into three groups or decanates, and the differences between the groups are subtle in parts, and large in other parts. For those who prefer a whole sign approach to horoscopes, simply read the first decanate regardless of your birthdate. Early today’s Sun semi-square to Neptune points to some possible meandering or straying from the usual routine, and perhaps calls up the need to make some adjustments to our overall route toward meeting our goals. If we’ve neglected our emotional or spiritual hunches and ideals, this can be a time for giving them a listen. Venus aligns with Chiron today, and it’s a time for expressing compassion or forgiveness. We may feel drawn to problem areas so that we can repair them. We more readily see beauty in human weaknesses, and we are less inclined to see (or concern ourselves with) fault. It’s a strong time for building trust in relationships, as well as for seeing potential in one another, although the process might feel painful at points. Seeing the beauty in the pain of growing and repair is more likely now. The Moon continues its transit of brave Sagittarius until 6:49 PM EDT, after which it heads into responsible Capricorn. Today also holds strong energy for taking action towards healing, cleansing, guiding, or teaching. We can feel energized and inspired creatively today. Our detailed monthly horoscopes are designed to reveal and interpret the current transits of the Sun, Mercury, Venus, and Mars in your solar chart. Because these energies or transits do not unfold neatly into any given calendar month (many transits carry forward from one month to the next), you will find some of the energies continue from a previous month. For example, the Sun might transit the second house of your solar chart from June 21 to July 22, so that you will find a similar interpretation for this transit in both June and July's horoscope. This is normal and expected. Transits don't suddenly change as the calendar month changes. The Highlights section reveal lunar cycle dates. Lunar cycles repeat themselves approximately every 28 days, so it is normal to see the same lunar peaks, such as "Your Personal New Moon" and "Monthly career peak" repeat themselves from month to month, but with different dates. They serve as a helpful guide to cycle peaks in different areas of life, such as financial, career, romance, and partnership.